There is a clear and present danger in America. Over the past decade, it has taken over ten times as many American lives as immigrant Islamic jihadists. Neither candidate for president will discuss it publicly. They don't have talking points, much less a plan to protect the American people from this dire threat. I am referring to lightning. 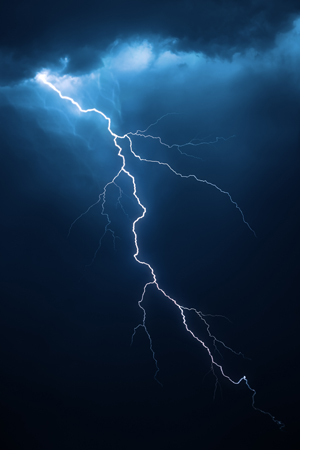 Over the past ten years, lightning has killed an average of 31 Americans annually. That's 310 lives snuffed out by thunderbolts, compared with only 16 killed by radical Islamic terrorist immigrants in the same period. This is something that ISIS has in common with the lotto - the odds are greater that you will be struck by lightning than win the lotto or be killed by an ISIS terrorist. No one is doing anything about lightning. Unlike the "extreme, extreme" immigration vetting proposed by Donald Trump to make our country safer, no one is talking about deporting clouds or banning rain or setting up a department of homeland meteorological defense. 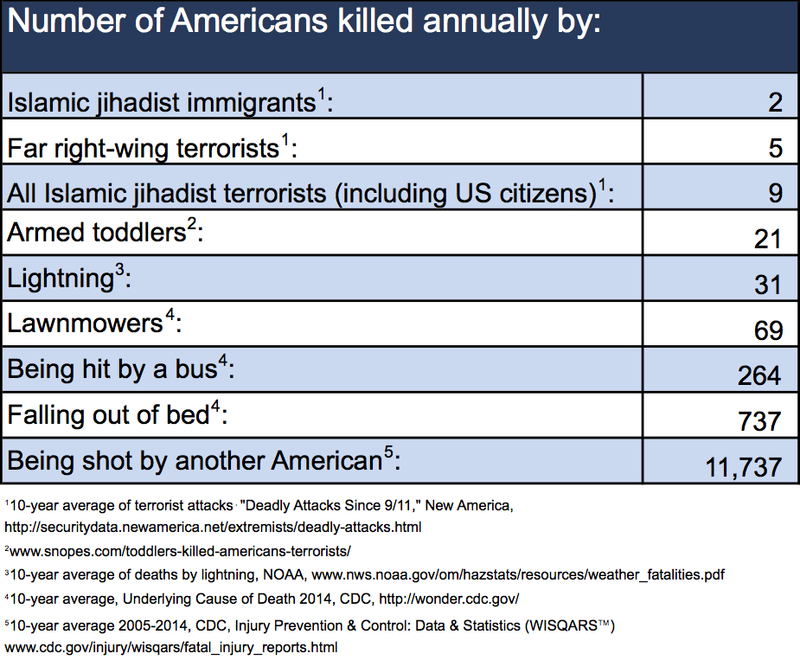 Another unanswered threat to Americans is the one posed by toddlers. 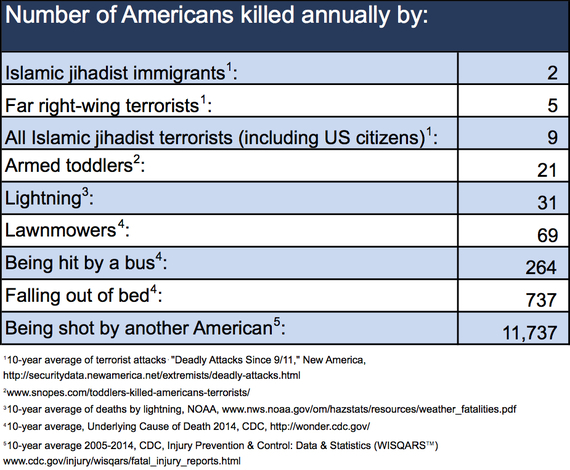 As was the case with lightning, armed toddlers killed more Americans than Islamic terrorists in 2015. Despite the extreme extreme threat posed by gun-wielding toddlers, no one is subjecting infants to ideological testing to determine whether or not they harbor hostile attitudes toward our country or its principles. The lapses in homeland security are indeed breathtaking. Though hundreds of Americans are slaughtered annually by radicalized lawnmowers and buses hell bent on imposing their mechaniacal agenda on our way of life, none of our presidential candidates have yet articulated a plan to keep us safe. Mainstream media, complicit in a dastardly conspiracy to blind Americans from perils hiding in plain sight, change the subject with coverage about immigrant Muslim extremists coming to kill us all. In fairness to politicians and the media, our collective memory of 9/11 demands eternal vigilance. We'll never forget the 2,996 Americans who were murdered by 19 Islamic terrorists who entered the country with guest and student visas. America's response to the terrorist threat has been robust. To date, the United States has spent 1.7 trillion dollars and nearly 7,000 American lives on the war on terror, along with the lives of 500,000 Iraqi men, women and children. •	2004 saw the sunset of the assault weapons ban included as part of the 1994 Violent Crime Control and Law Enforcement Act. Gun manufacturers were once again permitted to manufacture weapons like the AR-15, the weapon of choice for mass murderers. •	2005 brought the Protection of Lawful Commerce in Arms Act, shielding gun manufacturers from liability when their products are used to commit crimes. •	2016: republicans in both houses of Congress reject legislation that would prevent suspected terrorists on the no-fly list from purchasing firearms. While high-risk individuals may not board a plane, they are free to buy as many guns as they wish. On average, 11,737 Americans have been shot to death every year by other Americans since 9/11. That's over 180,000 lives lost - 60 times the number of people killed on 9/11 and 7,200 times more than have been killed by Muslim immigrants in the United States over the same period. No significant federal gun control legislation has passed Congress since 1994. In fairness, Congress hasn't done anything about lightning either. Some things are simply beyond our control. The next time someone dies in America, before you blame immigrants, remember that the odds are greater that you can blame it on the rain.